1. Put the coconut milk in the fridge to chill, ideally overnight. For the crust, put the nuts in a food processor and whizz until you have a chunky crumble. Add the dates, honey, ginger and a pinch of salt, then pulse a few more times, until the whole lot comes together. Tip the mixture onto a sheet of baking parchment and use your fi ngers to press it out flat to about the thickness of a £1 coin, then chill. 2. For the caramel, put the sugar and mashed banana in a pan over a medium heat. Bubble until thickened and a deep brown colour – about 3-5 minutes. 3. Slice the 3 whole bananas into thin rounds and toss in the lime juice. Get the crust out of the fridge and use a 7cm pastry cutter to cut out 10 rounds (you may need to re-press the trimmings). 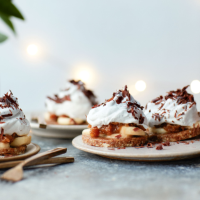 Use a spatula to transfer them to another parchment-lined baking tray and top with the sliced bananas. Once the caramel is cool, spoon it over the top of the bananas on each round, then chill. 4. Open the coconut milk, scoop out the thick top layer and put it in a bowl. Whisk in the honey and vanilla seeds until it looks like whipped cream. Chill for 20 minutes. 5. When you are ready to eat, give the coconut cream a final stir, then spoon it on top of the caramel and use the back of a spoon to create pretty swirls. Top with some grated dark chocolate and serve on little plates, as the bases aren’t quite sturdy enough to be held in the hand.